Best Service in Delhi, Noida, Gurgaon, Bihar, Ghaziabad, U.P..
Government of India in the Union Budget 2014-2015, announced the revival of Varishtha Pension Bima Yojana. Excerpts from budget speech by Honrable Finance Minister are, "NDA Government during its last term in office had introduced the Varishtha Pension Bima Yojana (VPBY) as a pension scheme for senior citizens. Under the scheme a total number of 3.16 lakh annuitants are being benefited and corpus amounts to Rs.6,095 Crore. I propose to revive the scheme for a limited period from 15th August 2014 to 14th August 2015 for the benefit of citizens aged 60 years and above"
LIC of India has been given the sole privilege to operate this scheme. During the lifetime of Pensioner, a pension in the form of immediate annuity as per mode chosen by the Pensioner shall be payable. On death of the Pensioner the Purchase Price shall be refunded. Guaranteed Lifetime Pension Effective returns 9.38% p.a Available From 15/08/2014 to 14/08/2015 Details: This is an immediate Annuity plan, which provides for immediate pension in consideration of lump sum amount. This is a Government subsidized scheme and will provide an effective yield of 9.38% p.a. The pension payable is guaranteed for the life time with return of purchase price. BENEFITS: Pension will be paid during the life time of the pensioner. Pension will be credited directly to the Bank Account of Pensioner. In event of death of the pensioner, purchase price will be paid to the nominee. ELIGIBILITY CONDITIONS : Age at Entry: Minimum 60 years lbd and above. Maximum ceiling will apply to all family members combined. All Age Proofs will be accepted. Premiums should be paid by cheque/draft drawn on local clearing house member bank. Cash will not be accepted. Service Tax: Service tax is payable @3.09% of Purchase Price. Policy Loan: Allowed after 3 years up to 75% of purchase price. Loan interest will be recovered from the Pension and Loan amount will be recovered from claim payable. surrender of policy may be allowed even earlier. Surrender value payable will be 98% of Purchase Price. 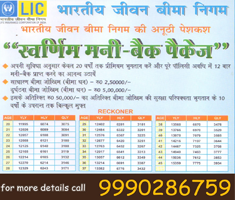 Hi, its good website for LIC Plans. Rajendra Arora (Delhi).